Kids dressed as zombies enjoy the events of Evanston’s 2nd Annual Zombie Walk/Marcha de Muertos. The walk was held Friday night at the Evanston Public Library. Zombies roamed the streets of Evanston on Friday night, scaring pedestrians through store windows and sending them screaming for their lives — at least according to the 9- and 10-year-olds who participated. 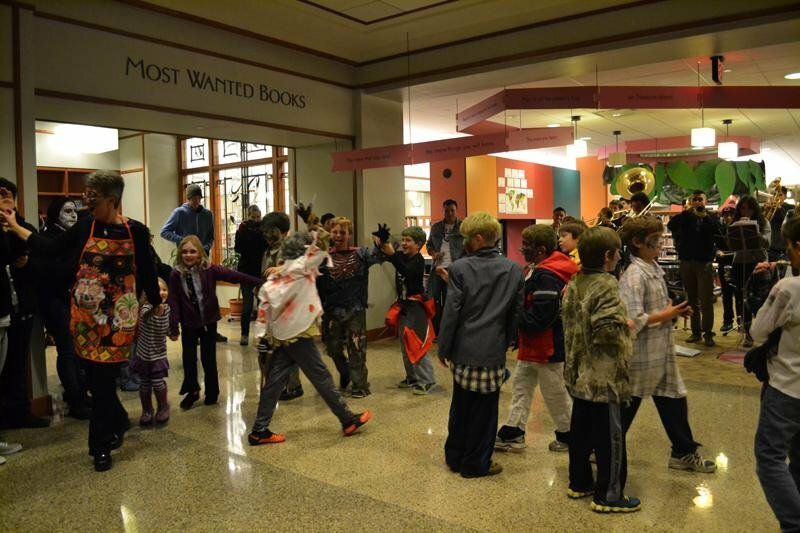 Elementary, middle and high school students took part in the Second Annual Zombie Walk/Marcha de Muertos, hosted by Evanston Public Library. Volunteers from the community and various Northwestern groups helped kids don makeup and walk around town. “I’m extremely happy with the turnout,” said Rick Kinnebrew, a librarian who helped organize the walk. He said the number of participants this year was much higher than it was last year. The walk was started by a group of Evanston residents, including Raul Rintorie, who had the idea to host a kid-friendly event the weekend before Halloween. His children and family joined in on the festivities, getting their faces painted and trying to scare one another as they walked. The event benefited Hillside Food Pantry, 2727 Crawford Ave. Each child was told to bring a can of food to the walk, but Kinnebrew said many families brought grocery bags full of donations. Kinnebrew said he decided to add the food donation element to the walk when he saw the lines of people waiting for food outside Hillside Church, which is across the street from his home. He said enough people brought donations to make the effort worthwhile, and he plans to continue the drive next year. During the event, children walked in zombie-like fashion, sticking their arms out in front of themselves and moving unsteadily. Some went up to store and restaurant windows and banged on them, attracting the attention of those inside. Conlin Audenaerd, an Evanston elementary school student, enjoyed the festivities with three friends, all dressed in intricate, scary costumes, complete with fake blood and shredded clothes. They came to the event to celebrate Conlin’s birthday, which was zombie-themed. Rachelle Brooks, Conlin’s mother, wasn’t worried about the possibility of her son getting scared.